Neste has published comprehensive data on its palm oil usage and supply chain in 2017 in line with its continuous commitment to transparency. Similarly to last year, Neste’s traceability dashboard presents information about Neste’s entire palm oil supply chain, from oil palm plantations to the palm oil refineries, completed with interactive maps and information on certifications, among other things. This year, the maps include also exact coordinates to the palm oil plantations in Neste’s supply chain. As the world’s first company, Neste publishes data also on its palm fatty acid distillate (PFAD) supply chain. PFAD is a processing residue consisting of degraded fats that are undesired for food production and removed during the palm oil refining process in order for the oil to meet food industry’s quality standards. Palm oil refineries yield 3–5% of PFAD as a residue. “The development of the dashboard and disclosing the PFAD value chain would not have been possible without the support and commitment of suppliers who put high value in our shared efforts to improve the transparency and sustainability in the industry. Engagement has been progressive and positive, enabling us to continue on our shared sustainability journey,“ says Johan Lunabba, Director, Sustainability at Neste. Publishing Neste’s PFAD supply chain to the level of palm oil refineries marks a significant milestone in Neste’s supply chain transparency program. Neste aims at becoming the first company in the world to map and verify its entire PFAD supply chain all the way to the oil palm plantation level by the end of 2020. The target is particularly challenging as reaching it will require mapping large parts of currently mostly unmapped food industry supply chains. The food industry, continuing to represent nearly 70% of the palm oil usage globally, does not have regulatory requirements to verify the exact origins of their raw materials. Only a few of the larger palm oil using companies have so far communicated about progress in tracing their palm oil supply chains. 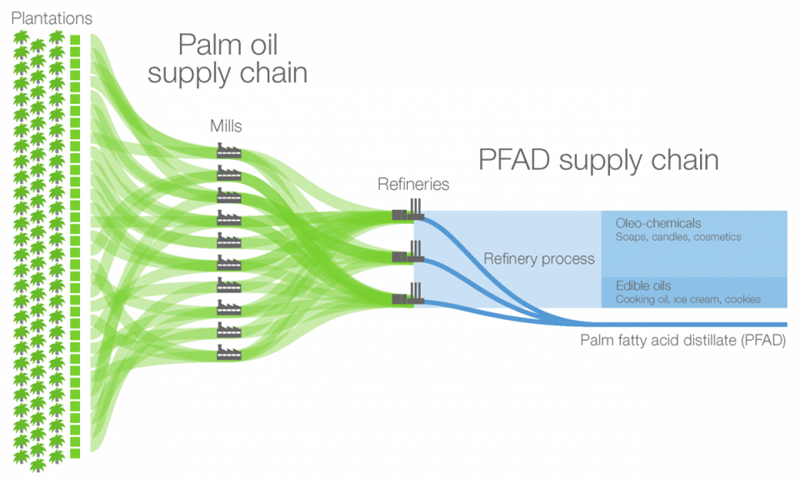 “Mapping and verifying global palm oil supply chains to improve transparency of our PFAD supply chain require large-scale engagement and collaboration across industries. This presents an opportunity to make a significant transformative impact on the sustainability of the entire palm oil industry,” Johan Lunabba explains. By the end of 2017, Neste had mapped and verified already 96% of its PFAD supply chain to the palm oil mills. These efforts significantly surpass the current regulatory requirements for biofuels producers to trace their residue raw materials such as PFAD to the place of origin, i.e. palm oil refinery where PFAD is extracted from oil. Neste continues working towards its 2020 target in collaboration with palm oil suppliers and the Consortium of Resource Experts (CORE) combining expertise of sustainability specialists from Daemeter and Proforest. Among the larger palm oil using companies, Neste was the first to make its palm oil supply chain fully transparent already in 2016 by publishing a comprehensive list of its suppliers on its website. This was done to show the company’s commitment to transparency but also to enable monitoring of its supply chain collaboratively with its stakeholders.